Next I was up to sing for Wish You Were Here. Disaster strikes – Kev has snapped a string, something he’s never done before. 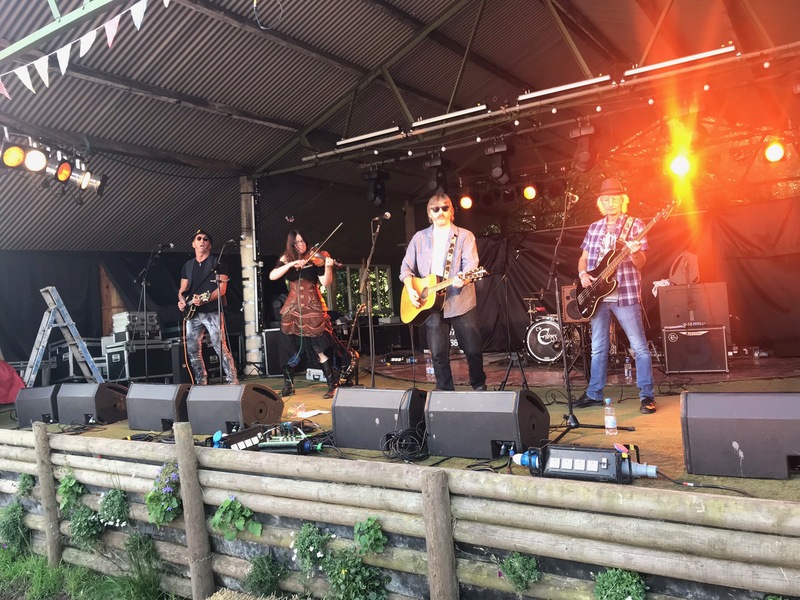 Erm, quick – ad lib – I bumbled through an unrehearsed explanation as to why we play the song – in memory my late Uncle and Aunty – whilst Kev embarked on the fastest guitar string change I’ve ever seen – good work! We were back underway. Back on the comfort of my box, Issac and Aimée took the stage to perform Bigger Man, then another change – Jacquie and Mark back on for Nights in White Satin, which gave me the chance to unleash the chimes, and some percussion for the fast bit Mark and Jamie have added. Aimée was back on vocals for a rousing Valerie, then Jacquie was back for Fifteen Years (more chimes, and Dean up on stage with a tambourine substituting for Jamie W). I was already starting to look at the clock, we’d timed the set for the full hour but even factoring in guitar string breaks, line up shuffles and general time between songs it was still going to come up well short. I kept quiet about it, everyone was doing really well no point in introducing panic into the mix! Dan had kindly agreed to join us for Mairi’s Wedding Part III so we needed to work on re-adding in the instrumental (which he’d hastily taught the string players before the set). It’s a lovely song – we didn’t know in advance that Drew was doing it too, but never mind! The set was supposed to end with Crash, another one we’ve rearranged and messed around with a few times in rehearsals – a slow start, a stop, kicks in, varying numbers of ‘na na na’s’ – personally I think Jacquie got it right with four, but who knows? Everyone caught up thought and I could hear the crowd singing back so it must’ve been okay – once it finished we had a good ten minutes left – so we pulled out Good Riddance, our soundcheck song, before finishing a little before time – but I hope everyone else was as pleased with the set as I was. People who’d watched said nice things too! 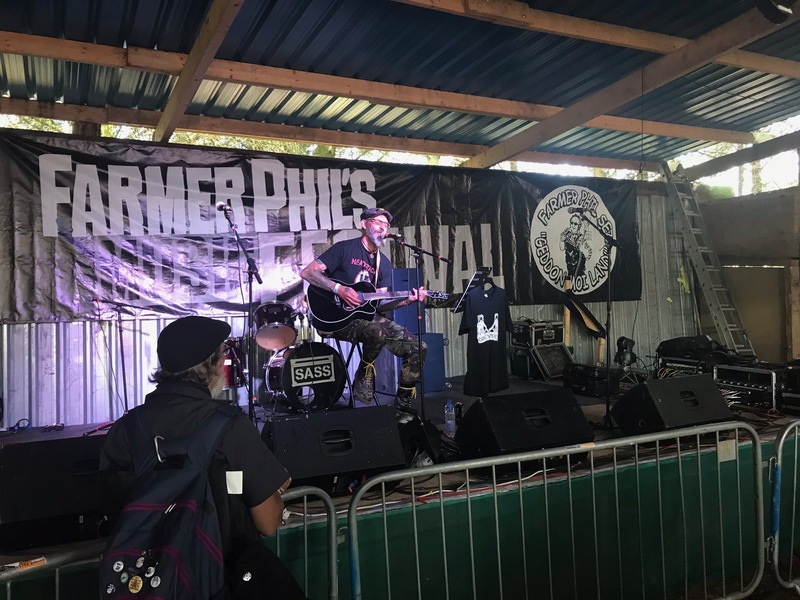 I packed up as quick as I could as I really wanted to catch a bit of Paul Henshaw and the Scientific Simpletons who overlapped us on the main stage. 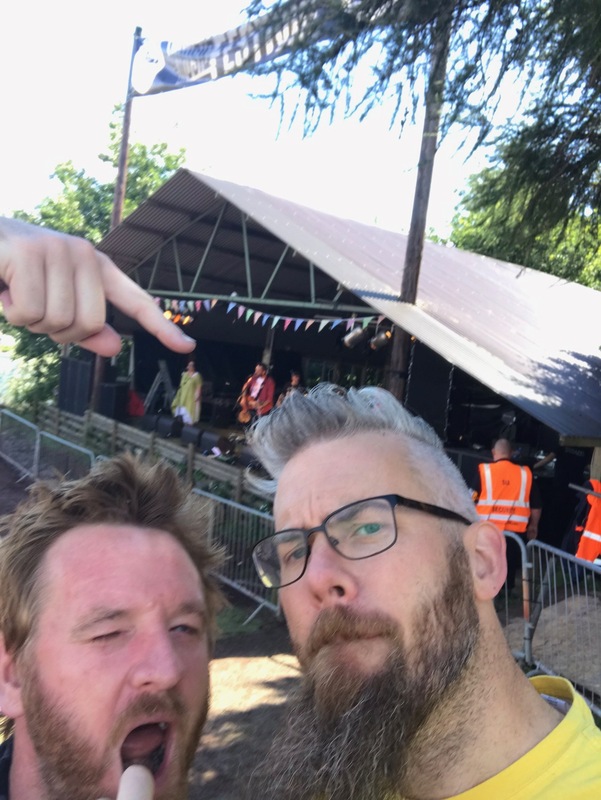 Bless him Paul had dashed round to catch some of our set and take a selfie in front of me, with sunglasses on I’d not noticed – but I dashed around to return the favour in front of him on the main stage with Nick. 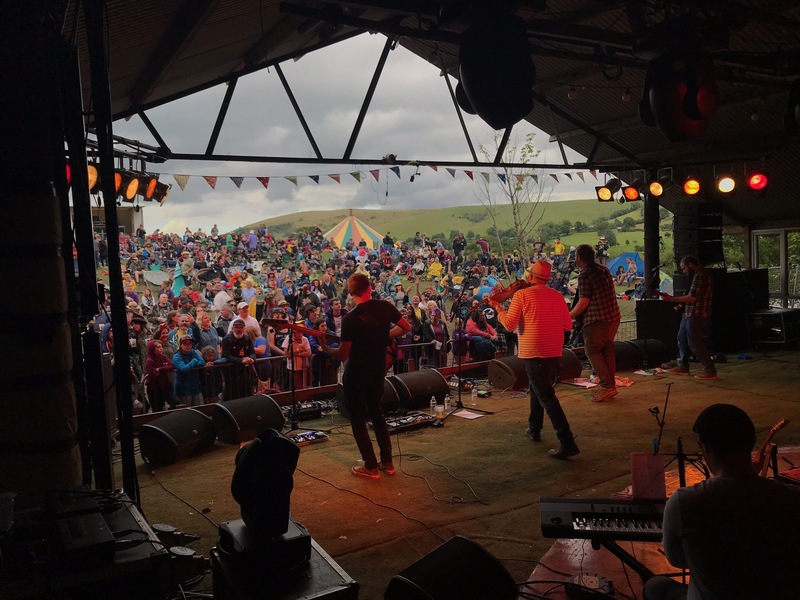 We got to listen to Churches of Rome and a song about Paul’s dad before we needed to nip back to get our stuff loaded to go back to the campsite and catch Dirty Davey who was following us on the second stage – clashes, eh? They can’t be helped. I’ve been pimping Paul to other festival organisers so hopefully I get to see them lots next year! 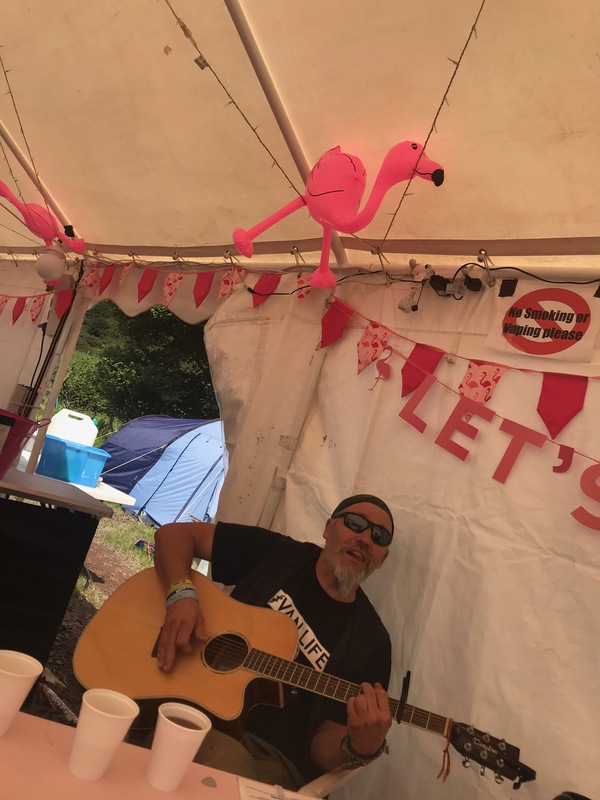 Dave’s set was already underway when we arrived – The Old Man was the song I heard first, emotional and passionate – I missed a title, then it was the a cappella Summer Fields and Riot Shields. A trip to the bar for a well earned cider, and a return to Have You Seen Them?, Hope and Glory a cover of Parson’s Lot’s The Battle of the Ebro and finally a rousing finalé of I Hate You Mrs Thatcher – the song that’s lyrics got him in trouble with Facebook for posting them, bizarre really when you think of some of the vicious diatribe you read on there from time to time! A solid confident set. 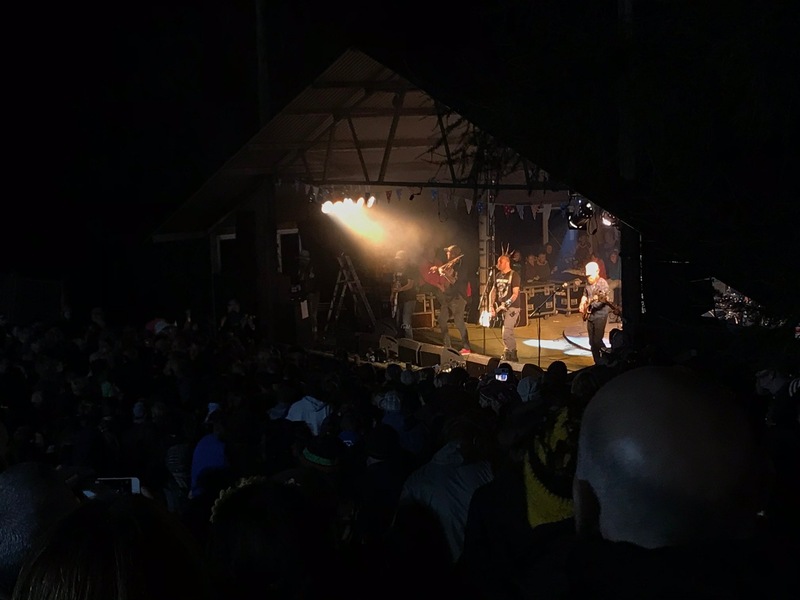 The Endings were underway on the main stage after this – they were playing the song I only know as ‘the hey ho song‘ – I had a good boogy and singalong to it, later in the set Far From Home featured and a soaring instrumental track. We’d been summoned back to the campsite for food though, this food co-ordinating was brilliant, each member of the camp was contributing and it saves a fortune compared to my usual tactic of just buying food at the vendors. It did help that we had two cadac thingers to cook or people with ovens etc. So we merrily munched on pie, mash and peas courtesy of Sarah and Dean whilst listening to the end of the set from The Endings (or The Ending of The Endings?). 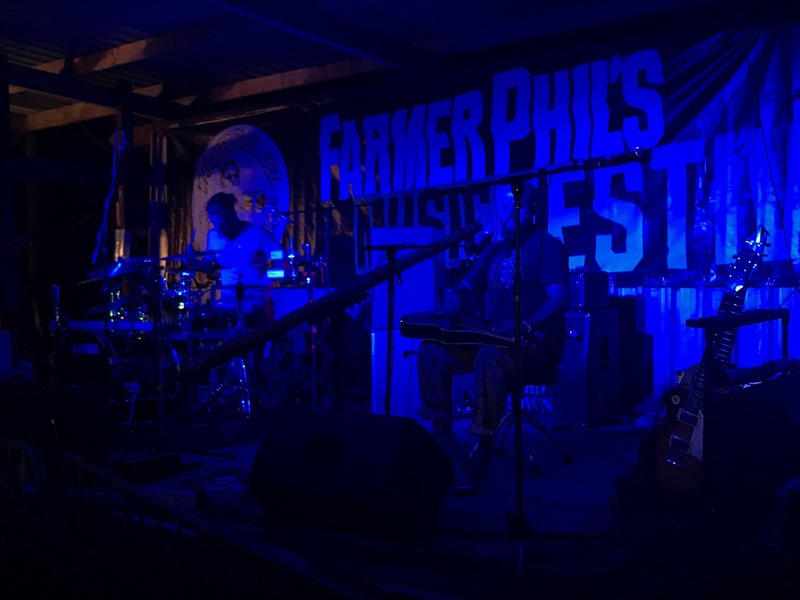 We’d timed our meal to make sure we were all ready in time for Nick Parker and the False Alarms on the main stage, a slight delay on getting us back on site due to a medical emergency. Unbeknownst to me at the time somebody I know, I’m happy to say that whilst it wasn’t a trivial matter he’s okay and back home now – get well soon Rob, sorry to have only got to see you very fleetingly over the weekend. 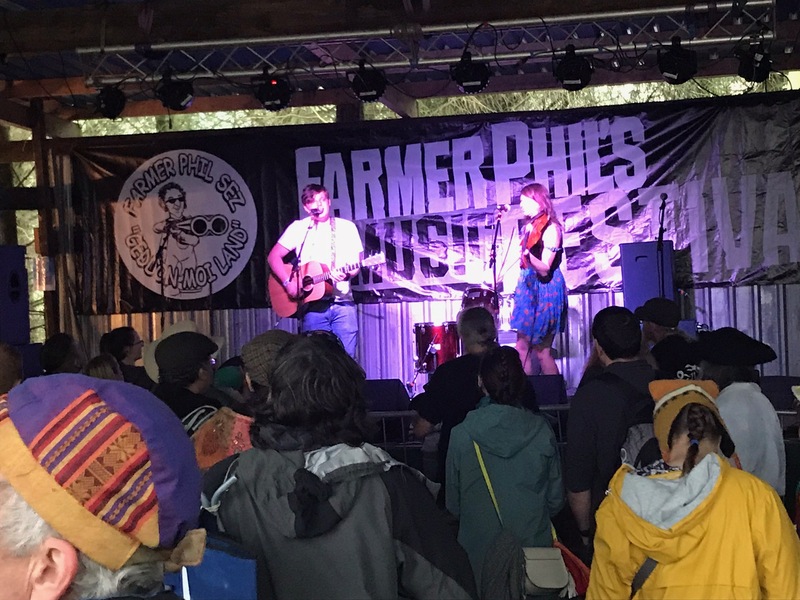 Once able to head on up we caught a bit of the excellent Morris and Watson on the second stage before setting up shop at the front for Nick Parker and the False Alarms to get underway, with Ben Wain standing in on fiddle. Make Yourself at Home kicked off the set and then into I’ve Never Been To Dublin Before. I’ve said it before and I’ll say it again, Nick’s songs translate exceedingly well to the full band sound. 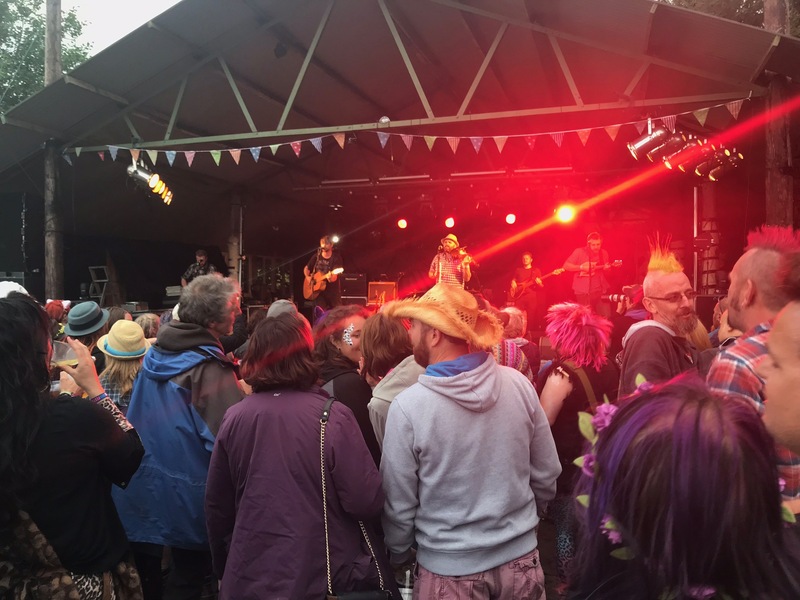 Down with the Yoof was up next – I’d forgotten to bring a double denim costume, not that it really matters! Something Someone Said led into Departures, then the scathing More Like This. A troupe of kids went on stage with big new placards for Es Tut Mir Leid to teach the audience a bit of German, always an education as well as entertainment. Jack bravely joined Nick on stage for Terry and June, having just seen his dad ferried off to hospital and put in a great performance, Metaphor was up next before finally finishing up with The Other Half where myself, Ella, Paul, Emily, Gaz and B-Sydes popped up for backing vocals (strange choice in my case!) but a fun way to finish an excellent set. 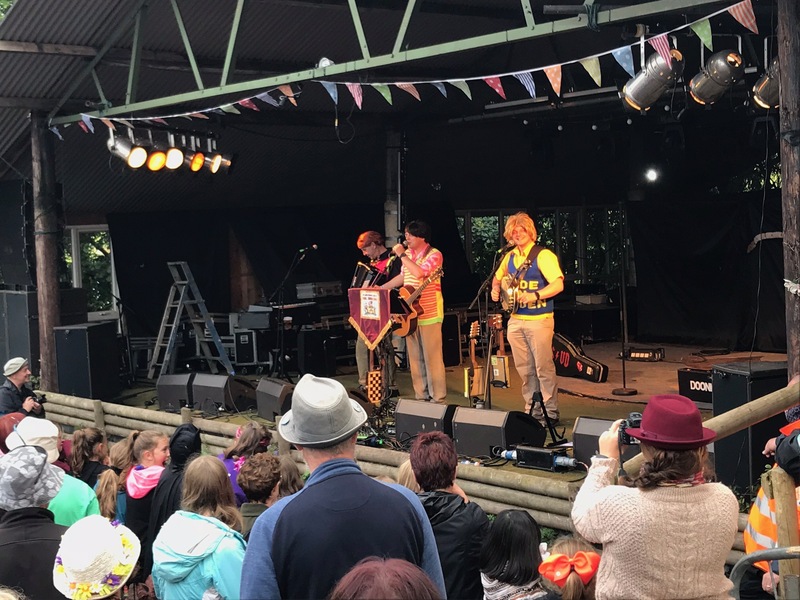 Another unfortunate overlap – Brian Stone was already underway, and overlapping at the other end with The Bar-Steward Sons of Val Doonican, but we popped over to make sure we caught a bit of his set and he had a decent crowd, which is good! 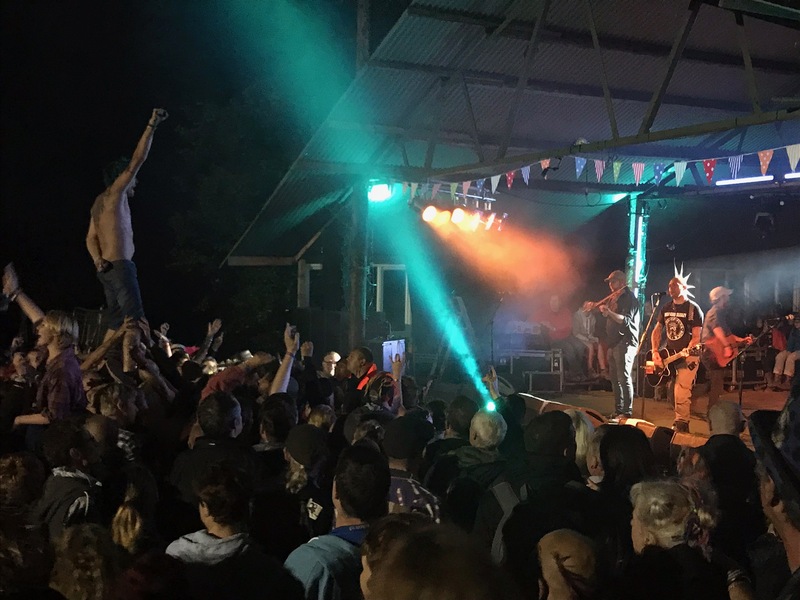 Never Drink with the Leylines and It’s Down to Us gave us a couple of infectious ear-worms to hum to as we made our way back to the main stage for the boys from Barnsley in lurid tank tops, already with most of the festival bopping away to them! We’d missed the launch of 99 red balloons they’d jokingly put on their rider only to find them provided! We got there in time for Bag For Life, which definitely rings true – I must have a dozen of the buggers in the back of my car! Nando’s, Since You’ve Been Ron, She’s From Dodworth – all can probably be considered Doonican classics by now, Walking in Manpiss is a bit more recent, and All the Dinner Ladies is from their latest album – makes me chuckle and evokes images of the assorted dinner lady characters from years gone by at various schools I went to! Pub DJ is also on the latest album, and the hidden track involving Alan’s love of ornithology which was up next. Paint in Back is an amusingly scathing look at the strange eyebrow tendencies some lasses seem to have, then it was Lady in Greggs which is one of my favourites. With Tom back in his guise of The Devil, it was time for The Devil Went Down to Barnsley, which was my cue for more stage invading – Maty (who was now nowhere to be seen!) had collared me earlier to say they wanted a bunch of people with backstage passes to go and jump around for.. you guessed it.. Jump Arahnd, so we did – Tom and I handily placed to help Scott into the dinghy to surf the crowd for a drink, the more qualified security guards helping him back again. Such fun! 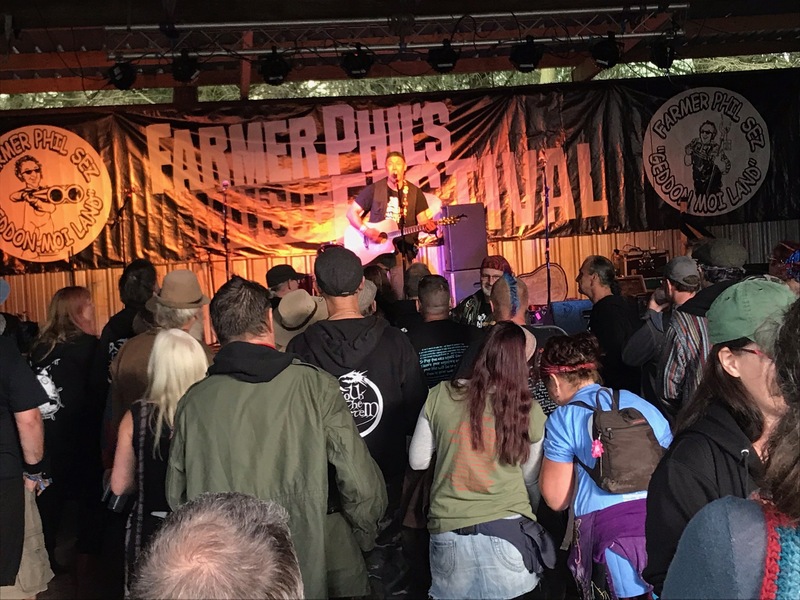 Gaz Brookfield and the Company of Thieves were up next – this was quiet exciting too. Like Nick, Gaz is someone I see a lot of in solo guise but have limited opportunities for a full band set! They launched into March of Progress and then Diabetes Blues. The next song gave a great opportunity for a ‘dad joke’ (it’s the fort that counts) for The Tale of Gunner Haines (probably my latest in a long list of favourite Gaz songs), Under the Table had everyone swaying with pints aloft, no prompting was needed for the ‘la la’ bits in It’s All So Rock and Roll, The Buskers Song had a lusty ‘Oi! Get a job!’ below from the crowd, all in all, very much going to plan! I love I’ve Paid My Money as I’m sure most regular gig goers do – lambasting the disrespectful chatty bastards who prefer the sound of their own voice to that of the musicians, and comprising of things actually said to Gaz in the course of his relentless touring schedule. 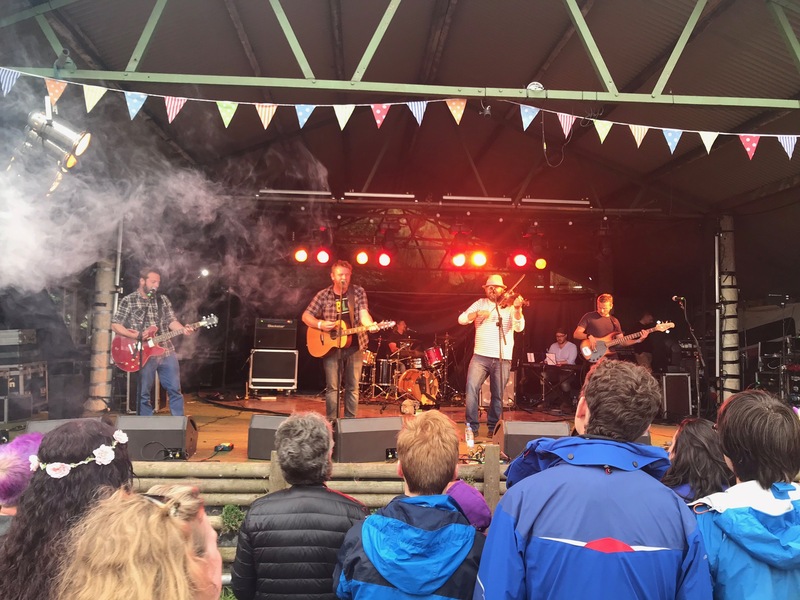 The World Spins Round is great, it’s got echoes of Ferocious Dog and 3 Daft Monkeys in there, lots of swirly folky punky fiddle and rhythm. I Know My Place is next, impassioned and scathing of what could drive a man away from wanting to use Facebook. Then we’re on to the stellar run of staple Gaz classics – Land Pirate’s Life leads into Thin, there’s plenty of crowd participation whether it’s the ‘whoa oh oh’s’ or the ‘but it’s not over, ’til you’re underground’ bits, Bigger Man reduces grown men to tears at times, especially Jamie although he was one of the big misses of this festival – with the epic finale of Let The East Winds Blow – as with other singalong songs in the set, the crowd didn’t need any instruction of what was expected of them – they delivered in spades. Exhilarating set, I always worry performers like Gaz or Nick might get lost in a full band line up, but they really don’t. 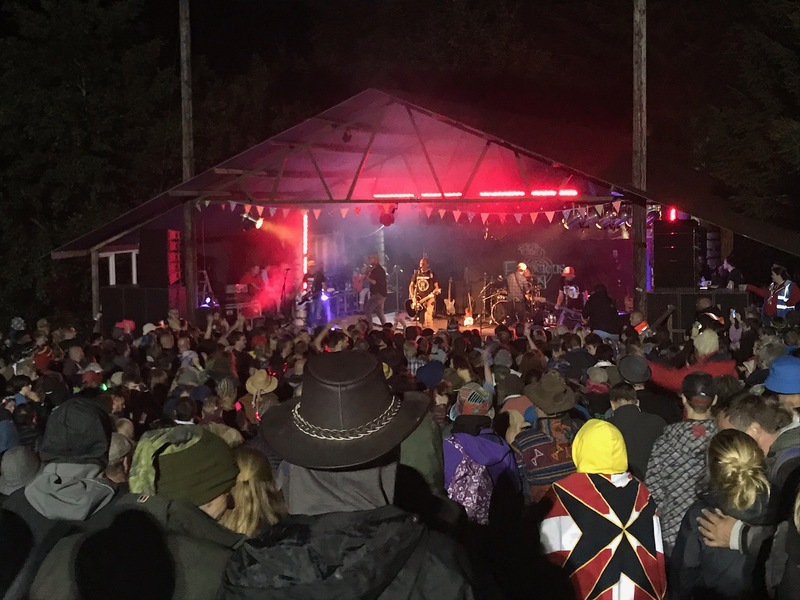 With a long day looming we found ourselves a spot on the bank with a view of the stage and easy access to the bar – Rusty Shackle provided the initial soundtrack, and I proved spectacularly bad at noting down track names. Jolene definitely featured at some point, I’m sure they deserve a much better appraisal than that! As do Urban Voodoo Machine, they entered the stage to the theme from The Godfather and gave an impression of Balkan folk music with an incredibly deep voiced singer. As you can probably tell, probably more drinking and chatting than paying attention at this point (but at least we moved up the hill for that!). We were paying attention to Ferocious Dog though, although electing like last year to watch from on high rather than join the mêlée in front of the stage. It was a cold night, Ella had already gone to bed – rather than disturb her I went and bought a new poncho to warm up, haha! 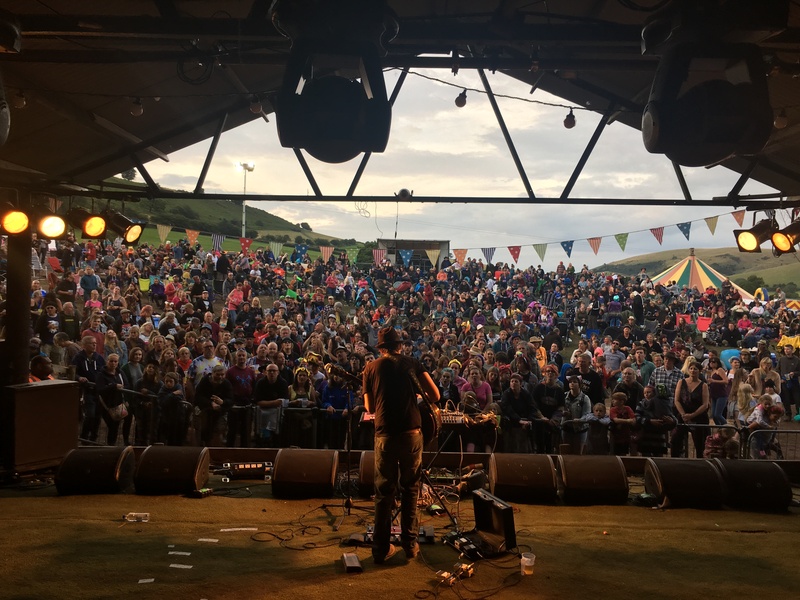 They started with Gallows Justice and then into Poor Angry and Young – taking the opportunity to thank Nick who’d donated a percentage of his merch sales to the Lee Bonsall Memorial Fund, which led neatly into A Verse for Lee, The Glass and Lee’s Tune. Looking at the front of the stage there was definitely no guilt at the mosh pit being down those of us who’d decided to hang back, it was populous and wild looking! Ruby Bridges was up next and then Crime and Punishment, On the Rocks I don’t think I’ve heard live for a while which was a nice treat – as Too Late came to and end (Nicki back up on Paul’s shoulders where she belongs), Ken turned to the mic and grinned at John Leonard. “He’s not Issac is he?”, referencing Issac’s amazing performance in their earlier set first thing on the Friday. Freeborn John saw Dean up on the board – no matter who else gets up on occasions there’s nobody quite up to Dean’s performances up there! Unconditional was next then Lyla, with Big T coming on for the roar complete with – who else – Lyla herself! A couple of new songs were then brought out, The American Dream and The Enemy Within – sounding much tighter and more confident. 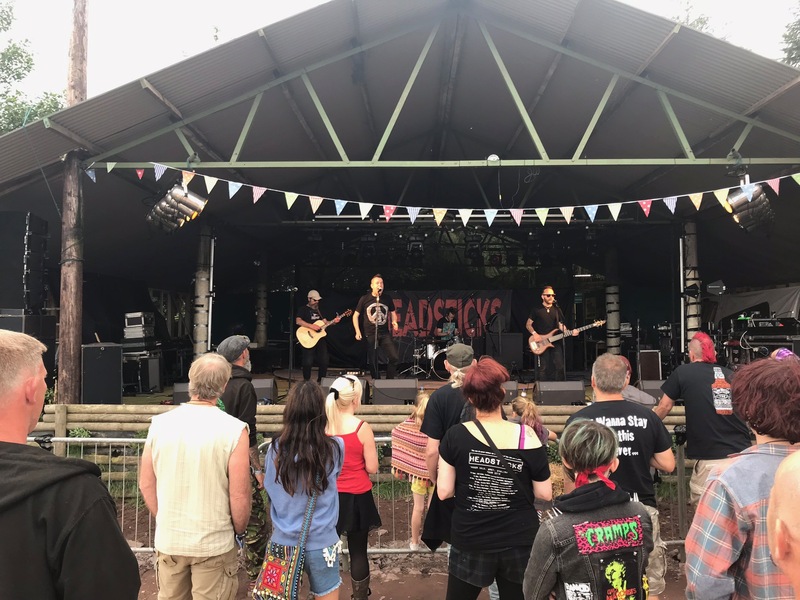 Then you’re on to the ‘home straight’ of Ferocious Dog sets – Criminal Justice leads into Quiet Paddy then Hell Hounds, dedicated to Jay and Kurtis, with Rhii up on shoulders for it and finally Mairi’s Wedding Part II. Of course there was always going to be an encore – Paddy on the Railway was an unexpected treat, as was watching Farmer Phil galavanting around on the stage with John’s mandolin, and of course Slow Motion Suicide to finish the set proper, I’ve made a note of a ‘new dramatic ending’ on my phone, but I really couldn’t tell you what that was! Epic finish to a long and tiring day – we made our way back down to the campsite, mercifully Ella hadn’t locked the van so I could get in without disturbing her too much. It was a bloody cold night though, that’s for sure! And a really warm morning! We needed to be up and about quite early anyway, bacon cobs and croissants were made for breakfast and we needed to head up the hill as Morganella were opening up the Russhuntel Stage. Whilst Morgan and Ella sorted and pondered I wandered up the hill further for a tea and to check in on Brian Stone’s meet and greet in the Pink Flamingo bar, and enjoyed a couple of songs – Norwegian Wood (and discussions of its similarity to The Boatman and Maelor’s Morning Sun), The Boatman. Believers is always a nice one too hear, and a sneak peek of a new song he’s been working on. A happy diversion. 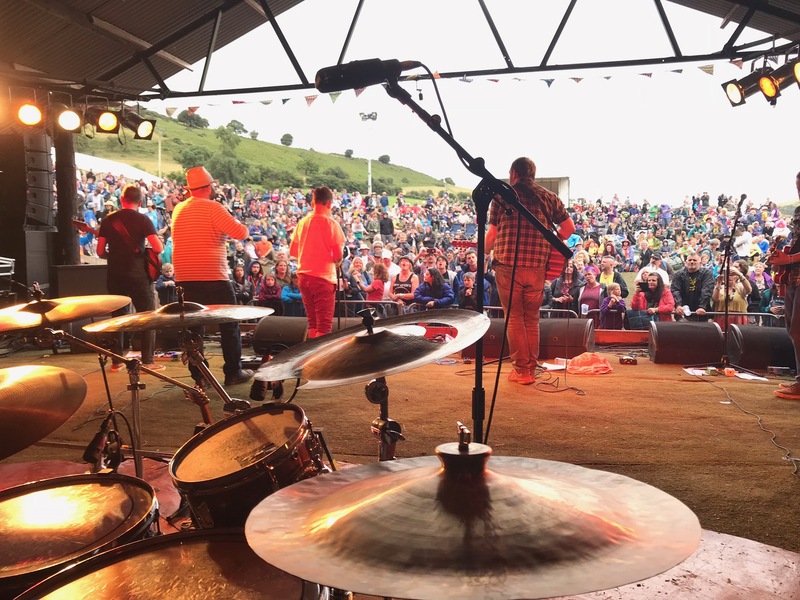 Of course much like with Morganella’s coffee morning the day before, I couldn’t linger too long – as that very band were due to kick off on the second stage! I was on recording duty with Ella’s camera – so found a good spot and set up. They arrived on stage and kicked off with Black Horse and a Cherry Tree, almost a trademark song by now. Ella was at her most confident on stage yet which was great, Morgan – well – he’s just a talented bugger isn’t he? At Simon’s request of a Beatles song they moved into Come Together which worked really well acoustically. 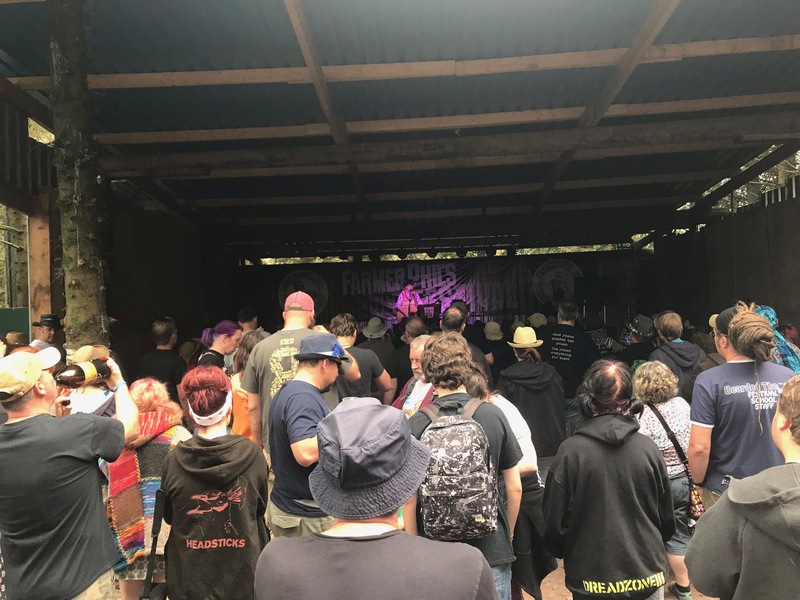 I say trademark song, but next up was one of their own – Fight Your Own Battles is sounding better with each playing, then it was back to covers with an acoustic rendition of Gaz Brookfield’s Black Dog Day (as we’d already nicked Bigger Man, ha!). Back to originals Daisies and Sunshine is an uplifting pace, and into Miss You. A new airing of an original song is Fade Away – ordinarily I’d say something like a touching account of the affirmation of a relationship, but being half of that relationship I’ll have to say it’s soppy – ha! It was actually rather moving, don’t tell Ella though. Ssh. 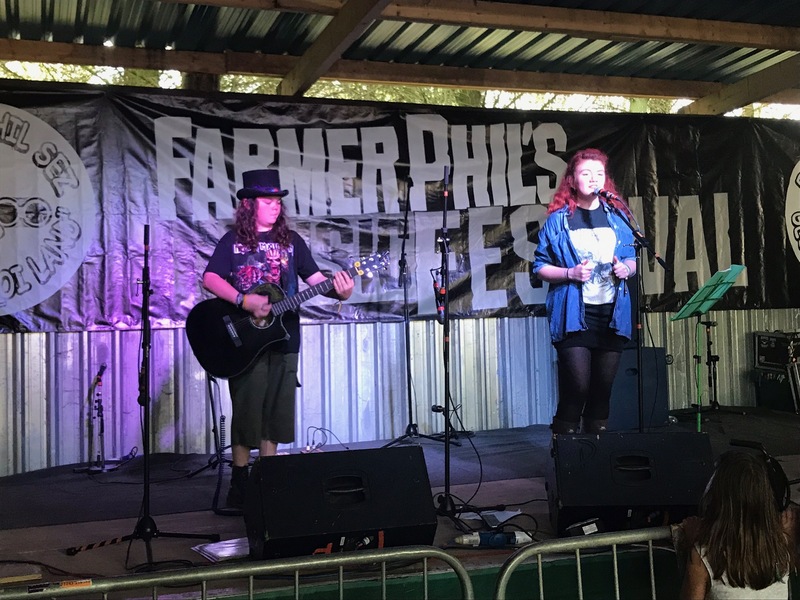 Another highlight of a Morganella set is their acoustic version of Weak, inspired by Skunk Anansie’s appearance at Bearded Theory and wowing Morgan, his acoustic working and Ella’s voice really work well for this! Similar to us they found themselves with more time left than expected, so threw in Wild Wood by Paul Weller as an unplanned bonus, and finished up with Frank Turner’s Photosynthesis. 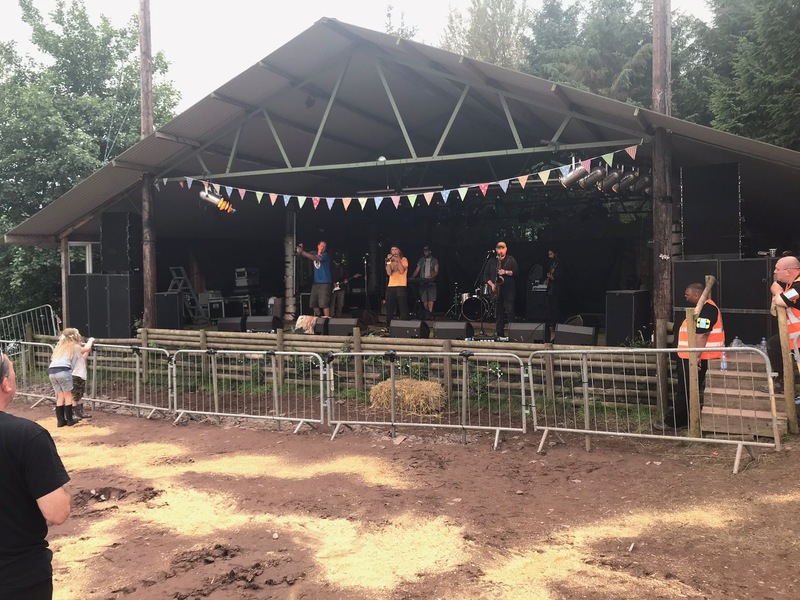 A really nice set – nicer for the sound crew too who didn’t have our ridiculous myriad of things to soundcheck this time around! Definitely the best I’ve seen yet – bodes well with studio time booked in for a first EP! There’s also a new YouTube channel to check out! 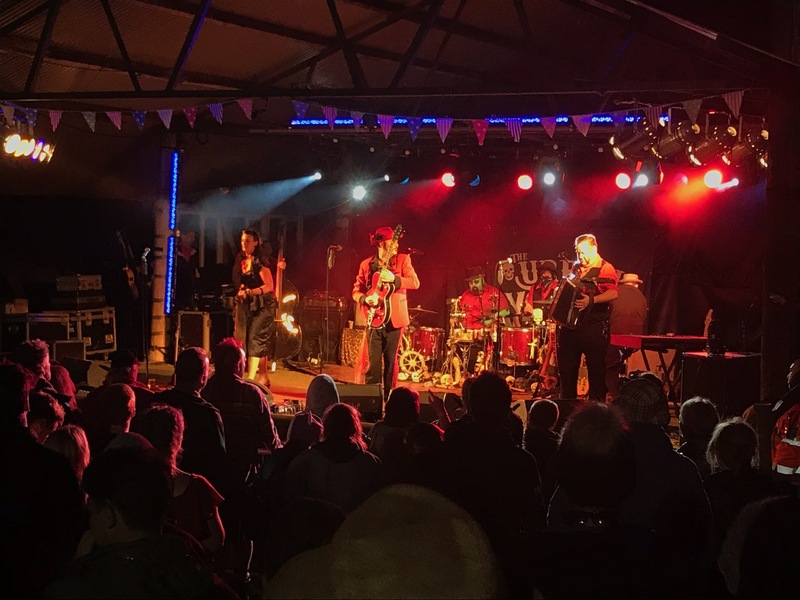 I nipped Ella’s stuff back down to the van after the gig, returning in time to catch a bit of Scott Doonican in front of a packed stage – then went to find the others who were bouncing around to Herbie Jack – a reggae ska hybrid full of fun and energy. I think their last song might’ve been called Frack Off, an impassioned two fingers up at this latest way the powers that be seem to want to destroy our planet for profit. At this point it was revealed somebody had been attaching Star Copiers branded pegs to people – nobody in the band knows anything about it, my money’s on Issac! 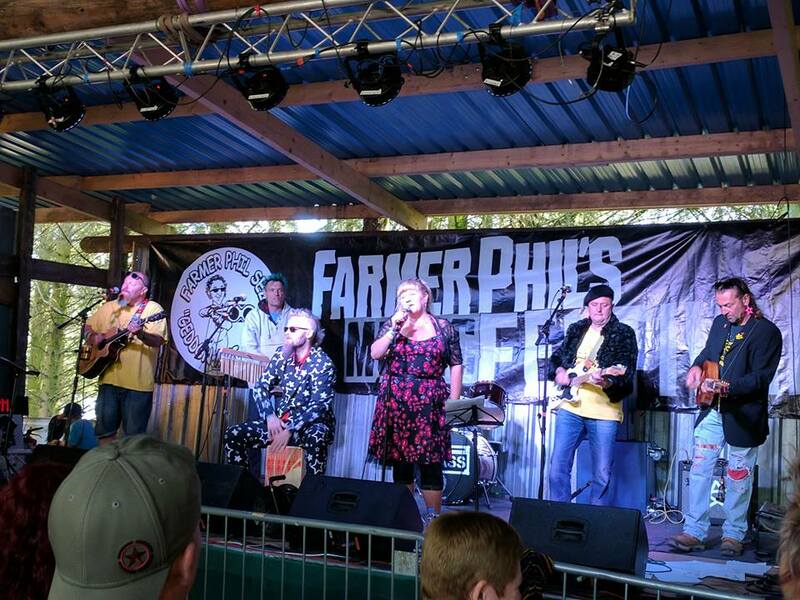 Headsticks were up next – they had a good crowd waiting for them as they launched into Two Sides and then Mississippi’s Burning. Full of vitriol and energy as ever. Flat Line Town was followed by Cold Grey English Skies before those (probably quite few by now!) uninitiated with the ‘Andrew stare’ got the full force of it for Fanatics. Rees was up again for What Do You Want, doing a fine job of things. I’m not sure what they next song was called, I recall Andrew saying it hadn’t been played for a while which is perhaps why, it was followed up with Pay The Price. 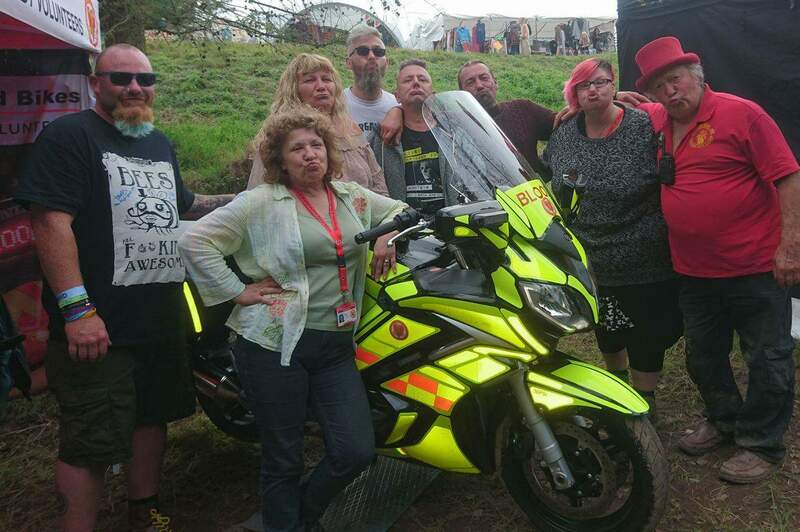 We’d popped to see the awesome volunteers from the Shropshire, Staffordshire and Cheshire Blood Bikes – they are doing really awesome work, funded purely by charity. It’s crazy to think that charity is required for such a vital thing – but there you go. It gave us a chance to admire a big shiny motorbike, which is always a good thing! By which point Headsticks were winding down with World Away – they’d put in another really good stint. I’d been really keen to see B-Sydes, and managed to see about one song! It was a good song though, I think it was called This Was My City Once which I really liked. 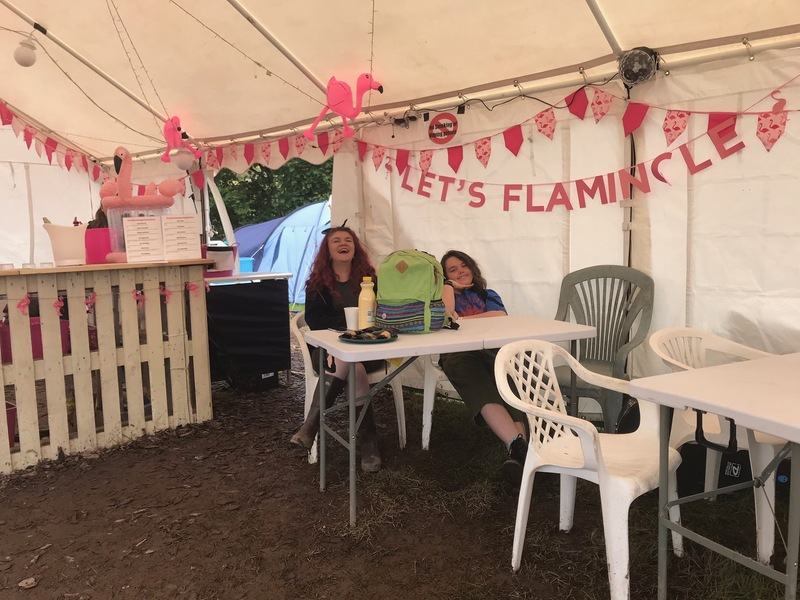 Then it was festival dinner time – an epic communal meal consisting of Nicki’s home made burgers, and we’d brought a mountain of halloumi, wraps, hummus and Ella had made some falafel too along with sweet chilli sauce. 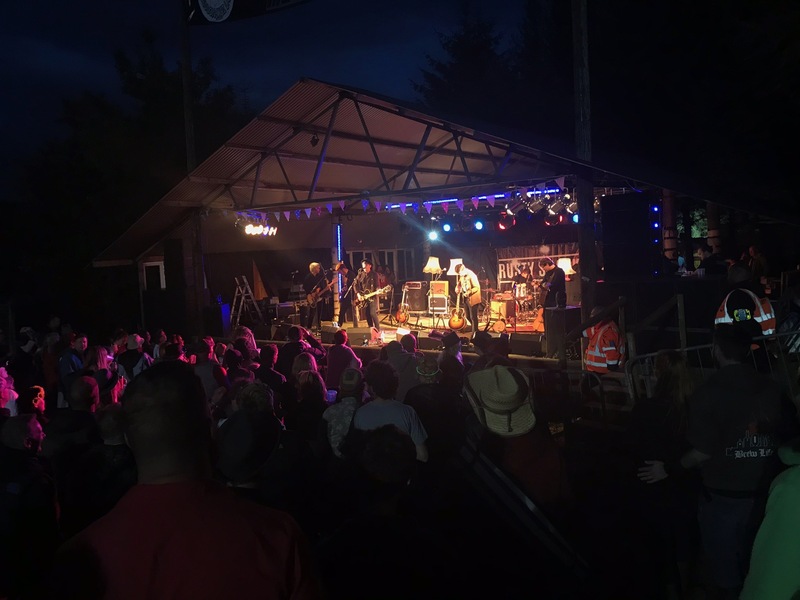 It was bloody lovely, and there was a lot of it – it was a bit regrettable that The Black Tar Rivers Band were providing the soundtrack (well, it was an awesome soundtrack, but I’d wanted to watch them too – they were amazing at Bostin’ Days) – but something has to give! Sitting and eating, drinking laughing it was tough to motivate ourselves to get off our arses and back up to the arena. A brief excursion to see The Sweetchunks Band was fun, not that I remembered my phone to take any notes – I know they started with Drunks on a Boat, and can’t help you with much more than that! 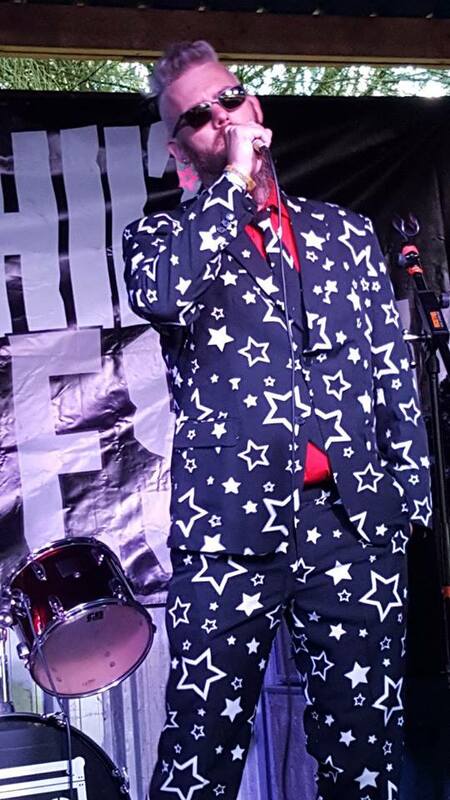 They were good fun though, of course, that was followed up with the mighty Funke and Two Tone Baby on the main stage again, Never Used to Dance starts the set and into Bella’s Kiss – then we get into a newer song, Work All Week leading back into older material – I’m Not Well. (I’m lucky Ella made notes here for me aren’t I? ), Ella was lucky to have seldom-played Anchor played and dedicated to her. Nice to Me was up next, echoing that sentiment of nice things happening to people who do nice things (if only it was always true, huh?! ), The Signal is Cut was next and then before we knew it we were finishing up with – of course – Not Enough Bonobo, with at least two ape-mask clad dancers joining him on stage. One was certainly the right dimensions to be Tom, the original pirouetting primate. How one man with an admittedly big bag of tricks is able to produce so much sound still amazes me, and I’ve seen him lots and lots of times now! I retreated to the campsite, but Ella was really keen to see Wille and the Bandits and Echo Town, so the revelry carried on in the campsite and gradually as folk were ready to go to bed, conscious of the drive home in the morning, I headed back up to find Ella – who, of course, was dancing at the front to Echo Town, their set was just coming to an end – I’m glad I caught what I did of them, two chaps, a drum kit, a lap guitar, a didgeridoo, a drum kit (which they were both playing at one point) – an absolutely astoundingly good sound. They were fantastic. We’d run out of energy and retreated to bed via a brief stay for sing songs with Kev, Julie, Duncan, Bart and Helen at their campfire. Reading back through my notes it’s lovely to reminisce about a fantastic weekend – and think “ooh, I missed stuff out” – Ella’s cheesy star-shaped biscuits, lemon drizzle cake, LJ greeting us at the gate and snapping our picture, countless other little or large exchanges with so many lovely people. Perusing the list of acts I missed too – Karl Phillips and the Rejects, most of Paul Henshaw and the Scientific Simpletons (I really couldn’t help that one), Devil’s Prefects, Folk The System, Jake Martin, The Black Tar Rivers, John Fairhurst, Treebeard, Ghosts of Men, The Fox and the Pirate (although I saw both their individual sets at least in part), Black Thorn (again at Farmer Phil’s!) – all acts I really love to see. Not to mention those unfamiliar acts I would’ve come to love! 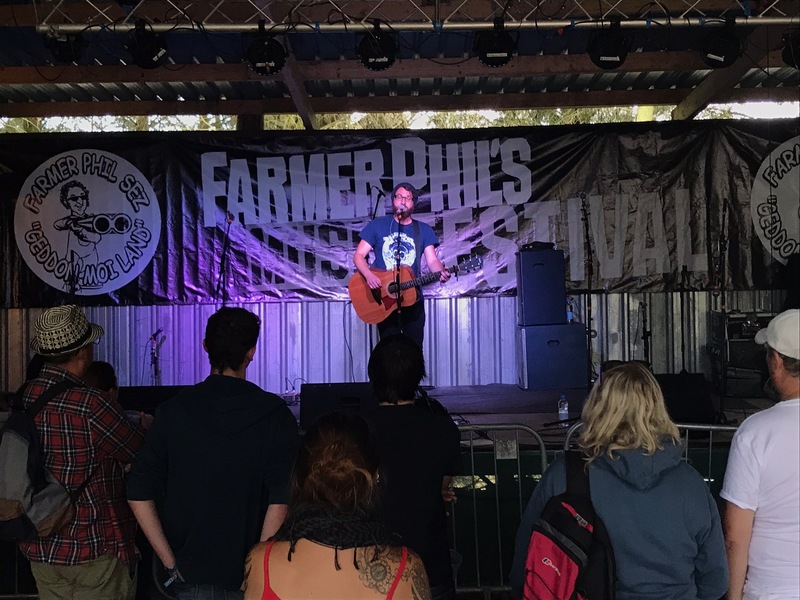 That said – I’ve no regrets, festivals are as much about watching live music as catching up friends or spending quality time with those you see more often, and we did that in spades. 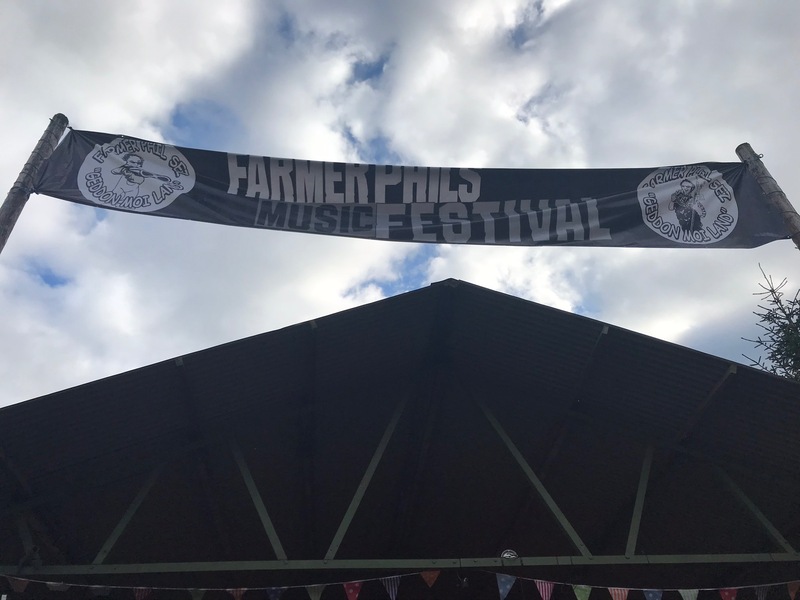 Farmer Phil’s really encapsulates this so perfectly – it’s one of the reasons I like to try to get onto the site a few days early to get some of this in before the music starts, but alas fate conspired against me on that score this year. 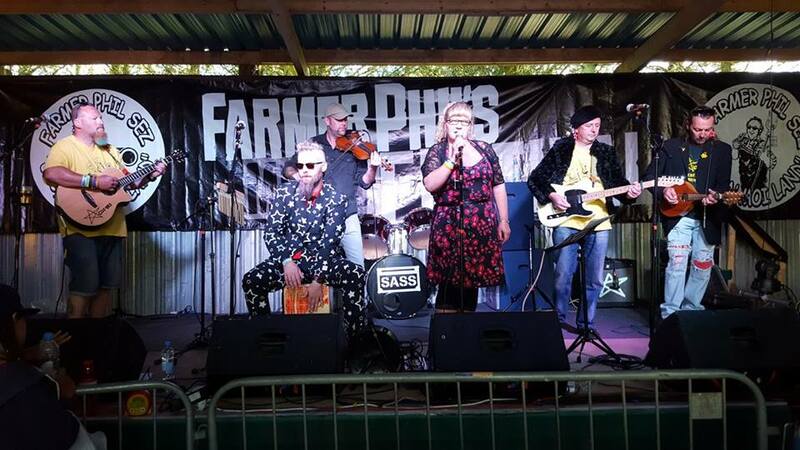 Whilst I made my Farmer Phil’s stage debut last year, to have the full back stage experience this year was at once alien, weird and also a great fly on the wall opportunity. I certainly know that as a member of The Star Copiers I can comfortably say on behalf of the band how humbled we were to be asked to play, and we absolutely loved it, as a mere punter which is what I am principally once again I left thoroughly exhausted of body but nourished of soul – the new long drop toilets a gigantic success, awesome new merch hut – developments are incremental and work to make the event better each year. 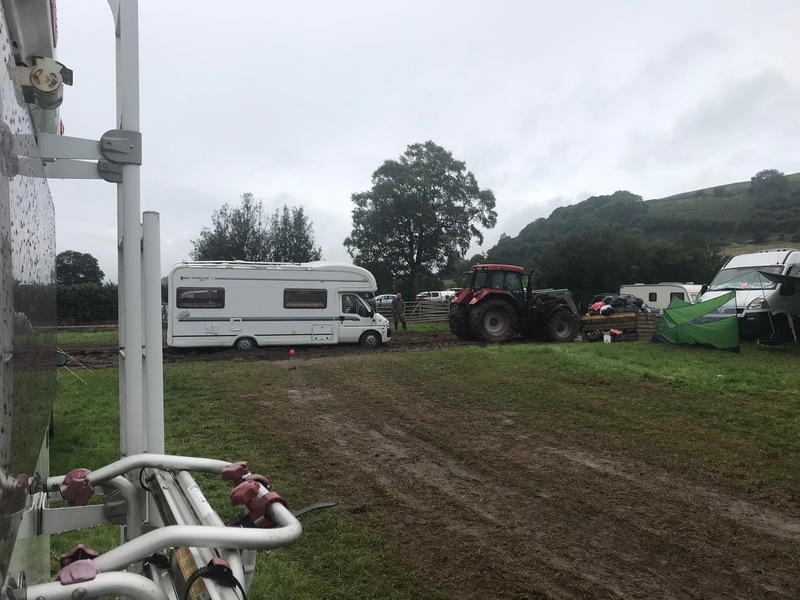 It rained a bit on Monday, but we only needed a bit of a shove from friends having cased out a route to get out – plenty of other folks required the attentions of tractors and Land Rovers to extricate themselves, the volunteers doing this were so efficient and helpful. A wonderful festival in every aspect. 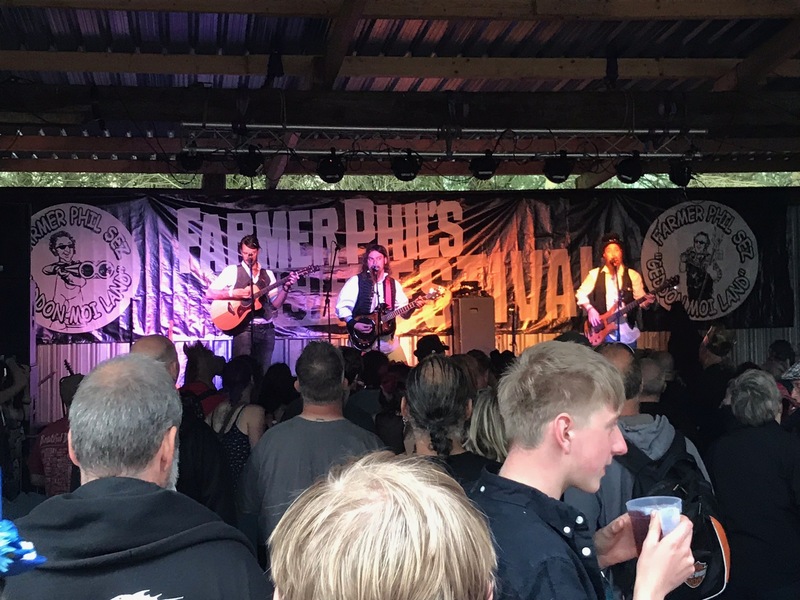 Apologies for the delay in posting – I’ve been in the Scottish Highlands since the festival and there was literally no signal to post anything or get my photos down from the cloud!